The inspiration for this look is a wintry cool vibe that utilizes layers of different materials and textures. 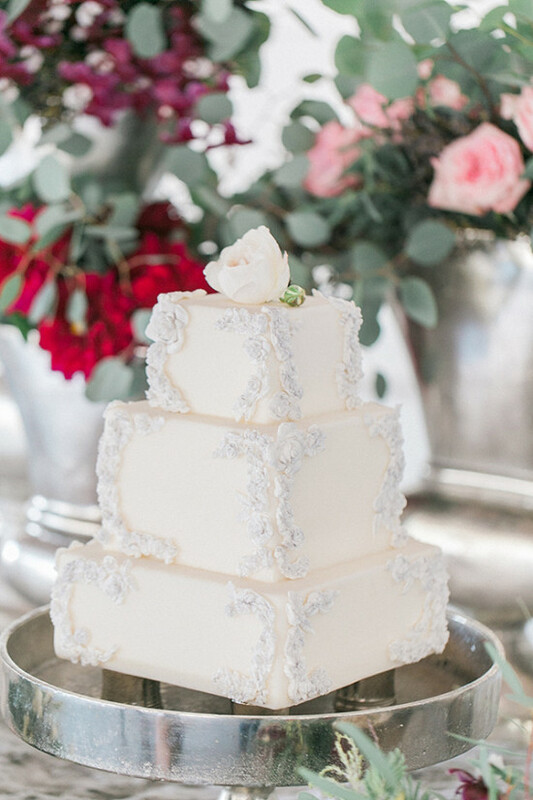 These talented vendors started with just a color palette for their inspiration. 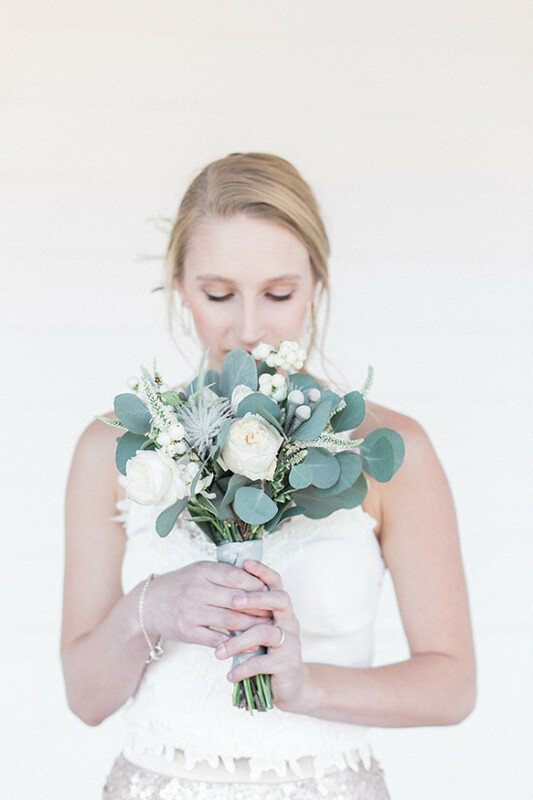 When planning a winter wedding, it isn’t necessary to go with what’s been done before, and don’t be afraid to mix metals! 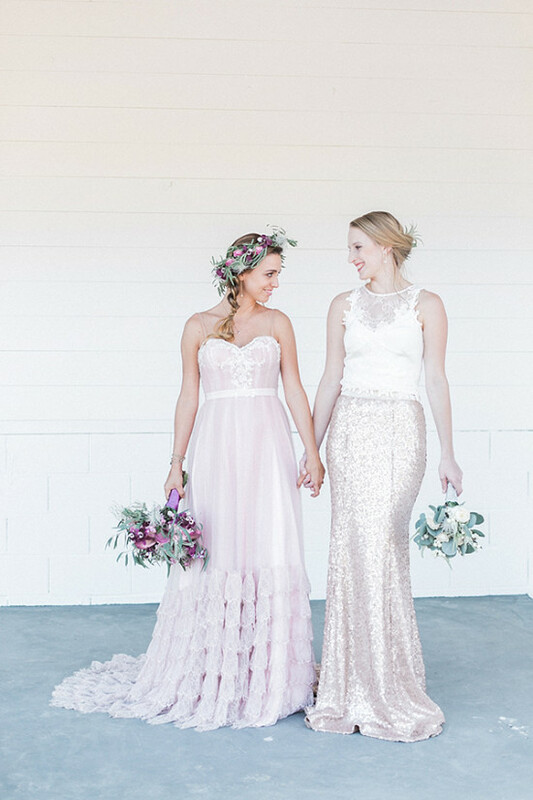 These blush and burgundy wedding ideas showcase different textures, shapes, and finishes. The key to keeping this from looking too busy is to make sure that you start with a neutral palette, then adding in stronger elements in smaller doses. Love it and want to see more? 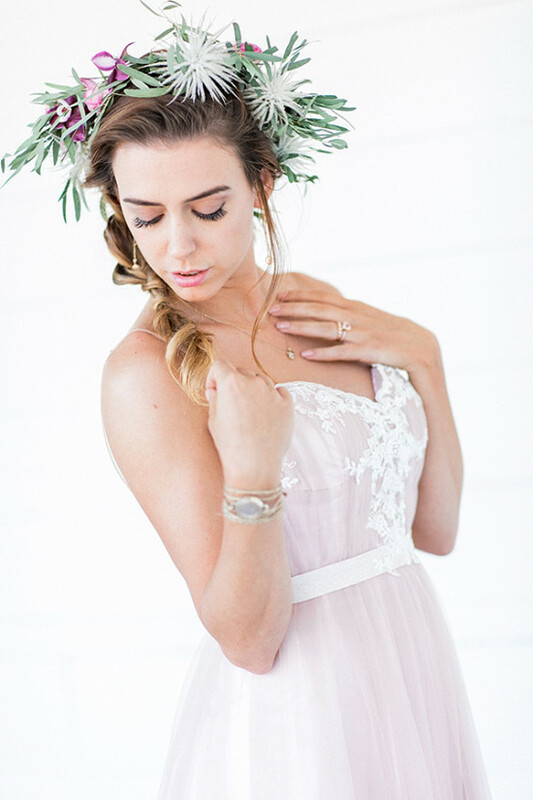 Take a peek at the full gallery here, photographed by U Me Us Studios. 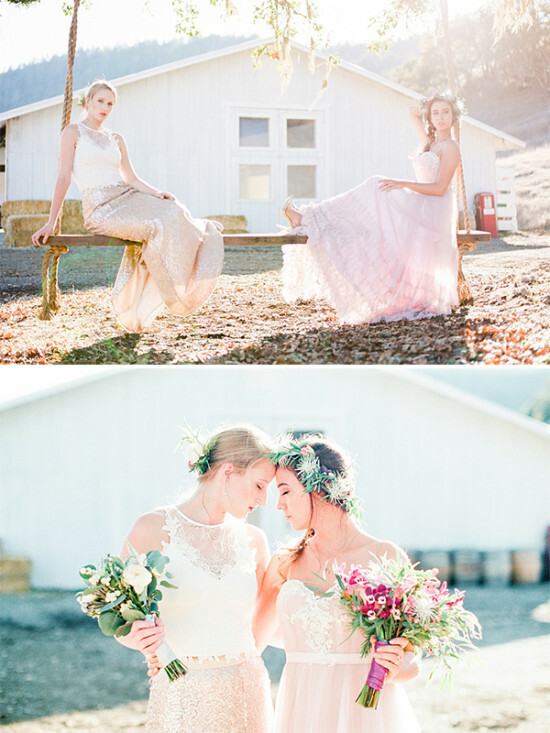 For the first bride, we styled a romantic vintage pink ruffle gown with a flower crown for the boho look and re-styled it with a wool floppy hat to give it a transitional winter to spring look. As for the second bride, we decided to go for a trendier approach with a 4-piece style combining style with functionality. 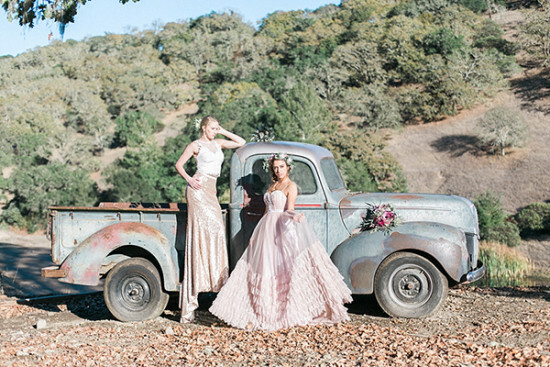 The bride wore an off-white lace appliqué crop top with a fit and flare rose gold sequin skirt. 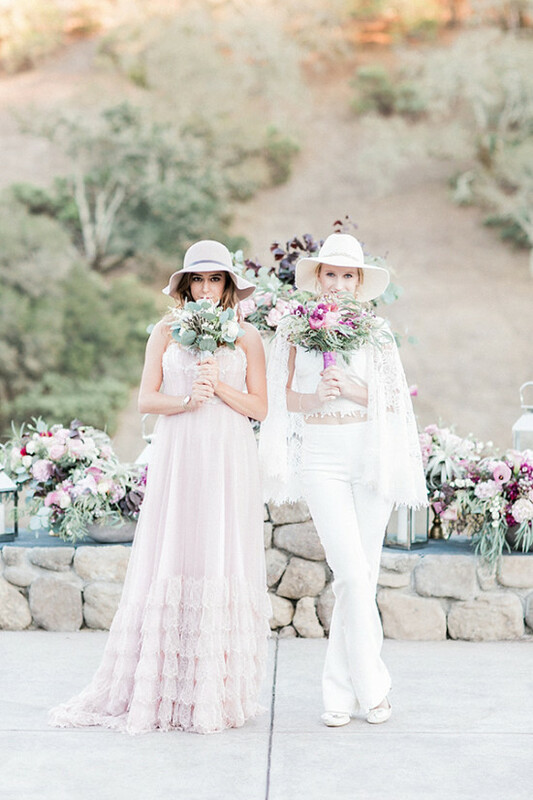 After the ceremony she changed into a pair of matching pants, lace caplet, and wool fedora hat with an edgier masculine style. French Oak Ranch is a private, family-owned, 300 acre ranch situated just past the quaint intersection of Calistoga and Saint Helena Roads. 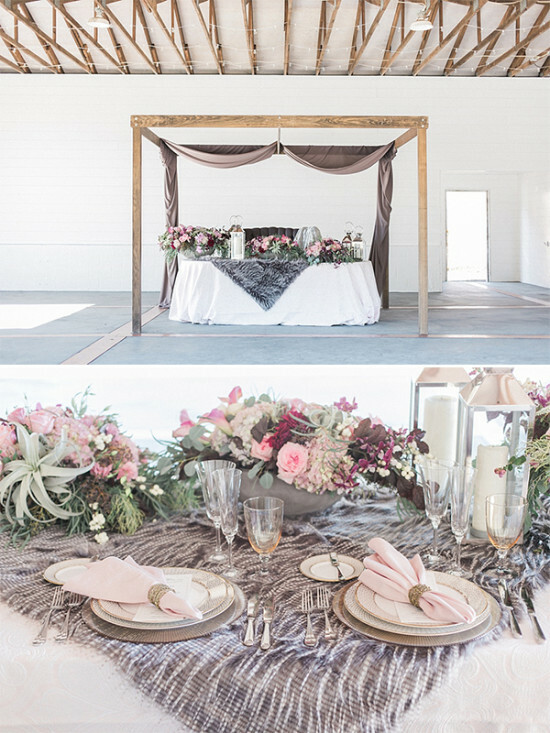 The timeworn 24-stall Arabian horse barn has been converted in a tasteful, timeless and simplistic style to complement any event and can comfortably accommodate up to 220 guests. The white wood-paneled walls create clarity, the weathered wood exterior and exposed wood and steel beams create a rustic element and the rows of white hanging string lights create elegance. 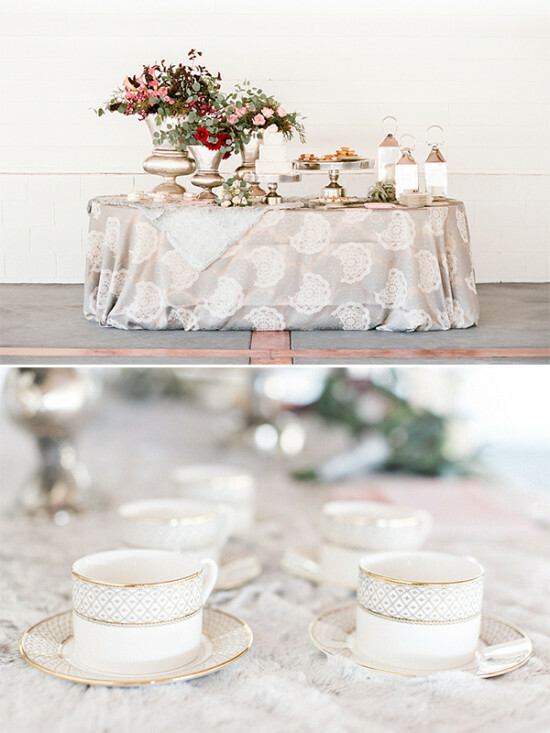 We started with a very elegant, tone on tone pattern, brocaded table linen. 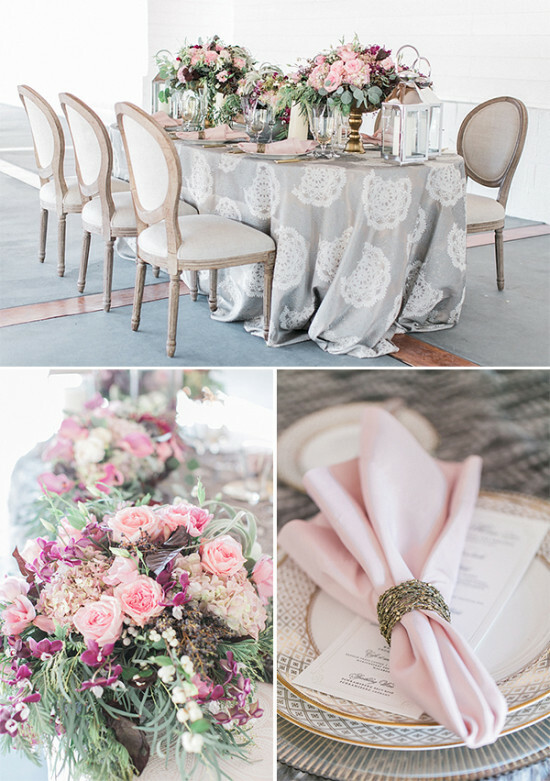 If you are afraid of pattern in your table linen, using a tone on tone pattern is the way to go as it gives added dimension and interest, but isn’t too jarring..subtle pattern adds a layer of texture that helps to give a luxurious look.For the bridal attire, we used two new 2016 styles for the brides. Wanting to give a nod to the winter we knew we needed some faux fur in there! This gives a luxurious feel that evokes horse drawn sled rides and a hand feel that makes you want to run your fingers through the blanket. 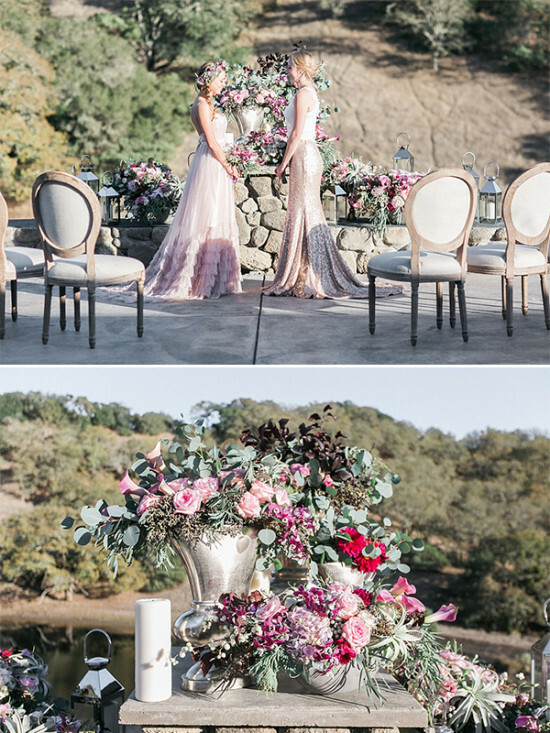 For the floral element, we used a combination of creamy ivory and pale pink roses, eucalyptus, Dahlias, hypericum berries, orchids, cala lilies as the base. We then dotted in a darker element to give depth, which resulted in us using deep burgundy ornamental cherry plum tree leaves. To add additional texture, we threw in some different types of Tillandsia or you may know them better as air plants!